Arrrgggh! 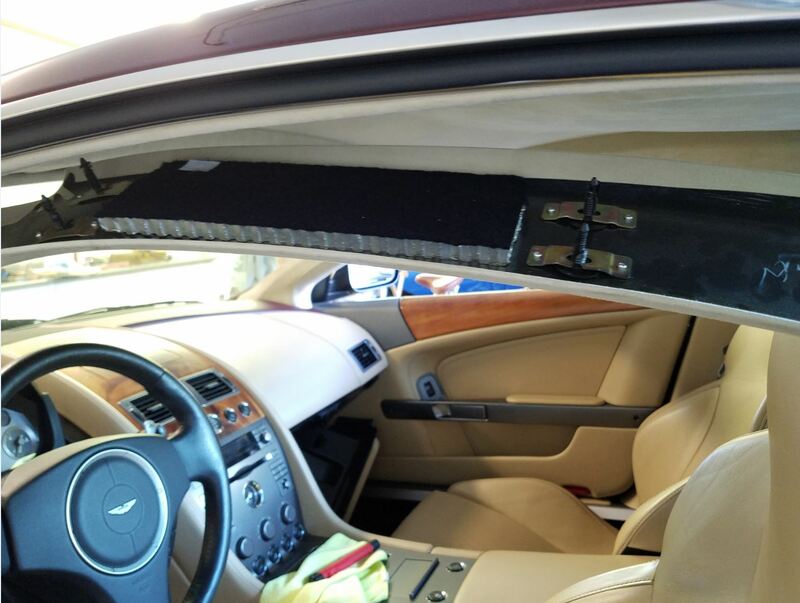 You may be wondering – “Hey, where are those articles on changing the Coil packs?” Well, I’ve been distracted by a new issue – the headliner in my DB9 let go and is sagging on my head. Not something you can really ignore, each time you get in to drive it sits like a cap on your head. Only got 10 days of driving bliss (after the Coil Packs change). Frustrating. In its defense, it was 103°F outside the day it went, and heat certainly speeds the deterioration of the glue. I don’t have a main dealer in the city where I live, so I’ve made a few calls (to the local Maserati and Rolls dealers) and they both suggested the same interiors shop. Spent this weekend learning how to remove the headliner from my car, along with how to remove all the Instrument panels (which the books and blogs talk about removing to get the A-pillar trim off). Basically, ripped my interior apart. I must be crazy. Oh yeah, and I think my Battery is getting weak, and I bet that goes soon too. Rrrrrrr. I love my car – I love my car – I love my car…..
My Coil Pack Change Long Weekend – DONE! Amazing! Almost all the issues you’re dealing with on your DB9 are, or have recently become, an issue for me in my 2005 DB9. Either you’re a curse or a blessing – I can’t figure out which! Equally, are you planning on covering cheap fixes for bubbling paint or a satnav screen replacement? PS My vin is A00112 – on of the first! Not really surprising I have issues! BTW – first of the coil pack video’s is posted, and the blog will go up on Friday coming up. I’m about to have similar things done – headliner glued to the roof, leather fissure fixed, inspection, new front grill and so on and so on. BUT – as I’ve been on tour with my oldtimer for two months what was really a fine thing, I was absolutely enthousiastic when I started my DB9 this afternoon for a drive. It’s worth almost every effort!!! I just discovered your blog a day ago and I ran out to the office garage on lunch today with a pair of pliers to uncork my exhaust. I’d love to hear more and see more pics on how you got the headliner off (as I’ll be doing it soon). Great blog and keep the posts coming. Awesome, glad you like it and hope if helps you with your car. My headliner and 3 leather bits on the dash only cost $200 to be repaired by my local upholstery shop (I did the remove/install labor). Working on the next post now…. Love what you’re doing here, great articles . I’ve found your information so much help with the issues I have with my 2005 DB9. Funny how all of us seem to experience many of the same issues. 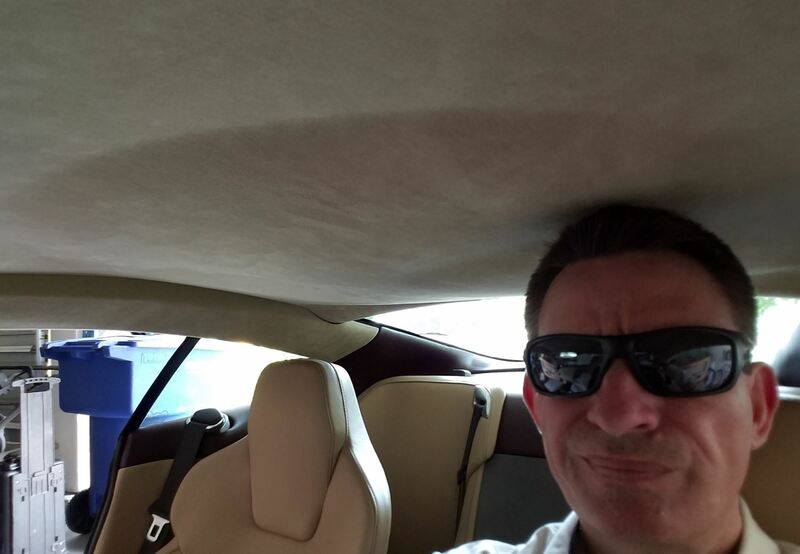 Thank You Aston Martin and DPO’s, I love my car, I love my car… I’m dealing with a common issue that my DPO didn’t and that is the saggy headliner. I’ve removed it and contacted a reputable upholstery shop and they said it couldn’t be reglued but to come on in and they’d discuss materials etc . There’s no way I’m putting something else in my Aston . 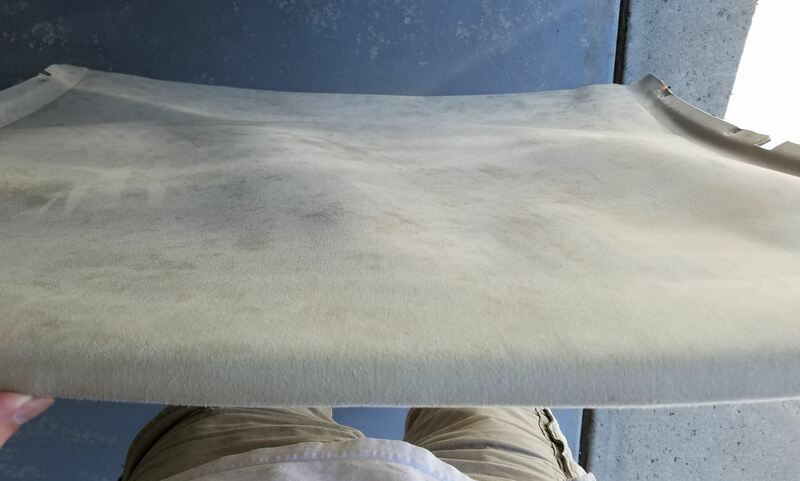 What process did your upholstery guys use, did you manage to keep your original alcantara? Seriously though, what a machine, every drive in these things is an event , so good. Hi Russell. Glad you are finding the site helpful, I will keep at it. Working on a whole series of articles related to the headliner and interior panels. My upholstery guy was able to remove the existing Alcantara, rub the dried glue off, and then carefully align and reglue it. Looked perfect afterwards. Cost about $150 USD. Great Steve, I always enjoy reading your new articles. Apart from the headliner my interior is really good. The only other issue I’m working on is the rear parcel shelf center section. I have that annoying rattling sound coming from the center panel when the weather is warmer. I’ve read that a few others enjoy the same phenomenon, it’s pretty straightforward to remove it and some foam stuck underneath it seems to do the trick I hear. I’ll let you know how I get on. Send along some photos or video of the process, maybe I can add it to the collection! If you go video, try and get the problem captured on video before its fixed (the sound and where its coming from) as this immensely helps people know if this is exactly what they are suffering from. Video with a good camera phone works fine. I decided to be brave and have a go at my own headliner. Getting the headliner out of the car in the first place was quite a project in its self. I’m sure you’ll cover in an article at some point, you end up removing half your interior, scary when you first start tugging on panels. I bought some more headliner foam and some 3M 74 spray glue and had at it. Removing the old glue and foam was a very lengthy and messy job. The headliner board its self is quite durable and will withstand wire brushing and acetone to clean off the old glue and foam. I used a small toothbrush sized wire brush and very light pressure to clean up the backside of the alcantara. I didn’t want to use any chemical cleaners on the alcantara as I was afraid of ruining it, I just used a super light wire brushing and a lot of paper towels to remove as much residual glue as possible. I Spray glued the new foam to the headliner board them trimmed it. The trickiest part of the whole project was re alignment of the alcantara to the board as there is nothing to trim so you basically only get one shot at it, worth taking your time at this point. To anyone attempting this project , using all new fir tree clips to reinstall all the panels is very important. These are one time use parts and will never secure the panels as well again. So Cal lately, So far so good. Everything is holding firm. Excellent write up. You’ve just summarized my article, but I will be taking the time to show how to remove the dash panels, A pillar and Fir Trees. I wasn’t brave enough to do the glueing, but will include a summary of your process if that’s OK. Send along some photos if you took any during the process! And yes, they rattle, making headway on that too. Your articles have helped tremendously with various projects on me 05 DB9. I thought that I was lucky and that my headliner would stay in place, but this week at only 21,000 miles, the center began to sag. I’m going to send it to a very talented upholster that I know, but since he has never done a DB9, then any instructions or video you might have would be very helpful indeed. I could not find anything detailed, if you have anything can you please send me a link? One last article on the PCV valve to publish first (tonight) and then onto the headliner….